Ken Austin passed away on July 28, 2017. Ken was the Chairman of the Board at K.O.I., and was the Instructor for Construction, Transport, Pond Modifications and Show Water Quality - all of which he helped write. He was our go-to guy for research, and had an extensive Koi library and an un-ending thirst for scientific knowledge. He brought professionalism to everything he did. No job was too big or too small. He jumped in and helped with all K.O.I. projects, and was the driving force in setting up the Drupal version of the K.O.I. web site. Ken loved teaching and sharing his enthusiasm for Koi pond science. Ken developed and ran a hands-on learning session about Koi anesthesia at the K.O.I. lab held at PNKCA in 2015. 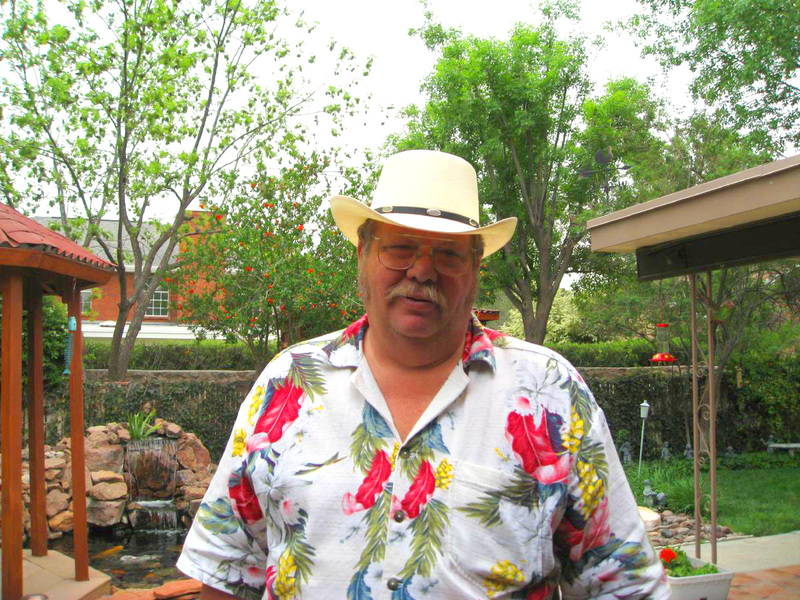 Ken engineered his own pond and many others in the El Paso area. He loved his pond and Koi, and built a Japanese-style pagoda of his own design to serve as a lovely place to sit and drink coffee and feed the fish. Several years ago, he decided he wanted to learn more about aquaponics, so he set up a hoop-greenhouse, and grew a fascinating array of pond plants and few household vegetables using the nutrients from a tank of Koi he had rescued. He frequently gave away (or sold for pennies) his extra Koi and plants to local Koi club members. Ken hosted club meetings yearly, and along with his wife Susie, they provided an amazing food extravaganza, and a wonderful garden to visit. He was famous for raiding his own stash of supplies in order to measure out a correct dose of a medication and deliver it for free to a pond owner in need - just because he could help. Ken was a master with his Big Green Egg, and started a BGE club in El Paso where other enthusiasts could share recipes and techniques. Ken generously shared his time and knowledge of all his hobbies with his friends, neighbors and Koi club members. He has left a legacy that few 'experts and Koi professionals' can match - because he actually researched and accomplished projects rather than just pontificating about how things should be done. And he did it all with good will, humor and a joy in learning that was unequaled. Thank you Ken! Ken was a thoughtful and effective worker for Koi Organisation International where he served as Chairman of the Board since the organization’s inception. He strongly valued truth and once said, “Everyone is entitled to their own opinion but not to their own facts.” He was a mentor to his students, a lecturer at conventions and club meetings and a significant contributor to the advancement of the Koi hobby. And maybe more importantly, Ken was a nice guy. He will be missed. Ken was a very important member of the Southwest Koi and Pond Association. His title was Second Vice President and in addition to his VP duties, he designed and printed our monthly News Letter, which is circulated to all our club members each month. Ken was a graduate of the Koi Health Advisor program and an Associate member of the Koi Organization International (K.O.I.) where he served as an instructor in the training program. During his association with these programs, Ken became very knowledgeable of everything associated with Koi and Koi Ponds. He was a very valuable member of our Koi Club, where he served as our expert person to go to when Koi and pond problems occur. Our Club Members will really miss Ken as a technical resource and most of all as a personal friend to all our members. Living in the UK, I only met Ken in person once, when my wife and I attended the PNKCA Convention in Spokane. I found him to be a very friendly, knowledgeable and helpful man, both in person and in the many emails we had exchanged over the years. Albert Einstein said, “The value of a man should be seen in what he gives and not in what he is able to receive.” Ken was a man who freely gave his time, enthusiasm and his considerable knowledge in order to help others and to help increase the general pool of knowledge in the Koi keeping hobby. He was a genuine person who gave, not because he had to, but because he wanted to. Sue also sends her condolences and regrets that we were not able to accept Ken’s invitation for us to travel over and stay with him. Rest in peace Ken, you will be missed and remembered. I very much appreciated Ken as an instructor as I went through the CKK studies, and I am learning all the time more about all of the behind the scenes work he did to help create and maintain our Organisation. I certainly extend my deepest sympathy to all of his family, friends, and loved ones, and will continue working to strengthen the organisation that he loved so much. Ken was the warmest guy or instructor I ever have. My deepest sympathy to his family. Words cannot express my sadness. May the comfort of God help us through this difficult time. He is Forever Remembered, Forever Missed. Ken was such a great, generous spirit! I'm glad I got to 'skype' meet him. Even though I never meet Ken, I have been privileged to know him through all of the wonderful educational information he was able to give to us Koi kichi people. People like Ken don't come around often, but when they do, they make a wonderfully huge impact on those around him. His legacy will live in the minds and hearts of all that love these beautiful creatures called koi. My heart goes out to all of his friends and family. He will be very much missed in this community. Rest in peace dear friend. All of us in the koi world will miss his knowledge. Ken was my Koi mentor While I was trying to take the Certified Koi Keepers exams, he was very friendly and patient with me. He was also always available to address the issues we had with ponds in our local club. Ken impressed me with his advanced expertise in a lot of engineering applications, and his common sense and creativity to figure out how to improve our ponds. It was a pleasure to work with Ken on editing numerous publications for Koi Organisation International. We will miss him dearly.